FMRL includes a chemist, materials engineer, licensed metallurgical engineer, and fire scientist with professional experience and training in root-cause failure analysis of plastic and metal products and components that are involved in fire and non-fire related losses. FMRL provides materials characterization and standard and custom testing of plastic and metal products, new technologies, and chemicals including metal powders, oxidizers, and flammable and combustible liquids. Intermediate and full-scale reconstruction, abuse-type tests, and reaction-to-heat and fire tests are tailored toward product evaluation. FMRL’s staff performs loss site investigation and support, including residential, commercial, industrial fire and explosion scenes and hazardous waste related losses requiring 40-Hour HAZWOPER training. 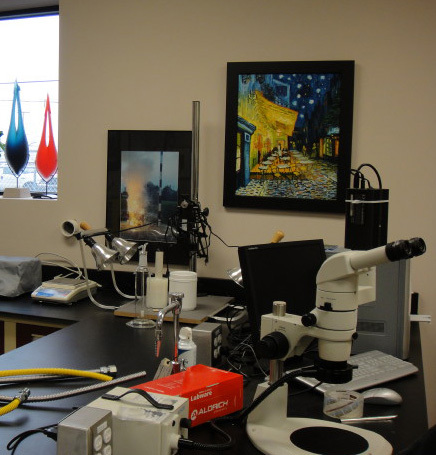 FMRL has a laboratory and conference room available for third-party independent inspections of evidence from fire losses. The laboratory facility has immediate access to full laboratory analysis capabilities, including stereomicroscopy with digital imaging software, thermal imaging, Scanning Electron Microscopy, Energy Dispersive X-ray analysis, Fourier Transform Infrared Spectroscopy, metallographic sample preparation and examination of microstructure, chemistry, on-site radiography, and a machine shop. FMRL also has access to current and historical engineering codes and standards and science and engineering library databases to supplement research and testing in the laboratory.